Luton to Liverpool Street Station Taxi Service – Luton to Liverpool Street Station Taxi Service: When it comes to Underground stations, Liverpool Street Station is on the 5th place in London. It is served by 4 lines including Metropolitan, Central, Hammersmith & City and Circle. There are 2 sub-surface platforms in the Liverpool Street Station. Platform 3 is disused and platforms numbered 4 and 5 serve the Central London Railway. They were constructed in 1912. The only platform that is wheelchair accessible is the eastbound one appertaining to the Circle line. 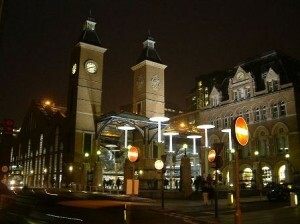 Liverpool Street Station is also served by 18 bus routes and by 6 night routes. There are no less than 31 trains arriving and departing each hour in Liverpool Street Station. The Great Eastern Main Line features trains to Braintree, Witham, Norwich, Clacton-on-Sea, Shenfield, Colchester Town, Southend Victoria and Ipswich. On the way, they stop in various other stations. With the West Anglia Main Line, you can travel to Chingford, Cambridge, Cheshunt, Enfield Town, Hertford East and Stansted Airport. Also, the trains stop in a lot of other stations along the way. Greater London operates most of the passenger services. C2c operates the remaining services, which are 2 shuttles going to Barking. An interesting fact about London Liverpool Street is that it is featured in the British version of Monopoly, along with three other railway stations. This version appeared in the 20th century. In order to get rail transport from London Luton Airport to Liverpool Street Station, you have to take the train to King’s Cross St. Pancras and the tube to Liverpool Street and from there, you can simply walk to Liverpool Street Station. Another option would be taking a London Luton Transfer to Liverpool Street Station. In case you want to travel by car from Luton to Liverpool Street, you must take the M1 motorway. Luton Airport is 34.4 miles away from Liverpool Street Station. You can get a London Luton Transfer to Liverpool Street Station by calling on 247 Luton Airport Transfer. The journey with the Luton Transfer will cost you 58 GBP for the smallest car and it will take approximately 1 hour and 20 minutes.